The new Scenic has a dual-color paint scheme similar to the Captur small SUV. The pillars and roof are a different color than the body panels. The contrast makes the minivan look sleeker. Renault says its new Scenic minivan has a “sexier” design while keeping its minivan practicality. The automaker today unveiled details and pictures of the fourth-generation Scenic. It has a radical new look that Renault hopes will help the model to regain the No. 1 spot in Europe’s compact minivan segment. “With the new Scenic, we opted to break with the past. It is a more modern and sexier people mover, but without sacrificing the modularity which marked the success of the previous three generations,” Renault design boss Laurens van den Acker said. The Scenic’s design was inspired by the R-space concept that Renault unveiled at the 2011 Geneva show, van den Acker said. Renault has given the Scenic crossover looks just as it did with the latest Espace large minivan. "We are walking away from the monospace [one box] boring shape and moving the boundaries a little between the minivan and crossover segments," Thierry Koskas, Renault’s head of sales and marketing, told Automotive News Europe in an interview. The new Scenic has styling cues from the Captur small crossover. 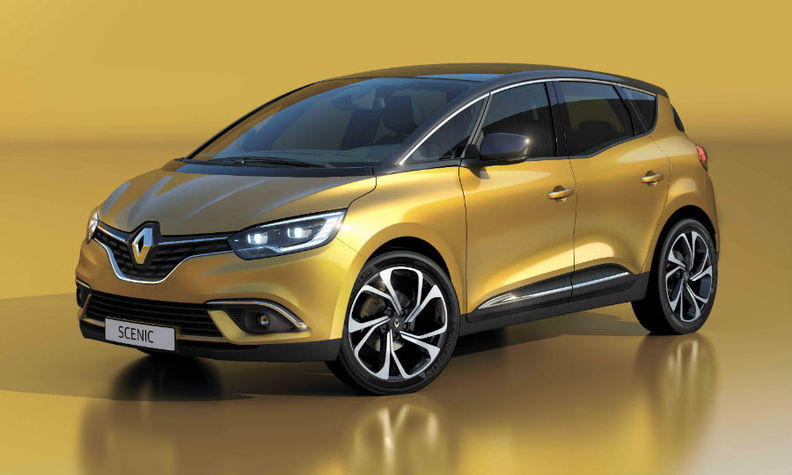 In a statement Renault said the new Scenic has new styling features to give it a dynamic edge. Its ground clearance has been raised and the rear overhang has been shortened, while a wider track at both the front and rear provide the vehicle with a particularly solid stance. The minivan has improved perceived quality both for the exterior and the interior, Renault said. Renault needed to do something bold to regain leadership in Europe’s compact minivan segment, which the Scenic dominated for almost two decades. The Scenic led the segment until 2014, when it was overtaken by the Citroen C4 Picasso. The first Scenic went on sale in 1996 as a minivan addition to Renault’s Megane compact range. It was badged as the Megane Scenic. It quickly became Europe’s best-selling compact minivan. The second and third generations dropped Megane from the name. For the second generation, launched in 2003, Renault added a seven-seat variant with a longer wheelbase called the Grand Scenic. Koskas said Renault will continue to offer a five-seat Scenic and a seven-seat Grand Scenic. Last year Scenic and Grand Scenic sales fell by 7.3 percent to 105,171 in Europe, placing it No. 2 behind the segment leader, the Citroen C4 Picasso/Grand Picasso, whose volume declined by 6.3 percent to 111,418, according to data from JATO Dynamics. The overall compact minivan segment in Europe declined by 12.5 percent to 587,215 units. Analysts at IHS Automotive predict that the new Scenic will rise to the top of the segment in 2017 with about 145,000 sales. The Scenic will debut on March 1 at the Geneva auto show and will go on sale in the second half of this year.